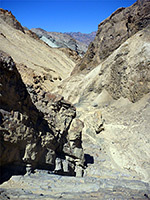 Most of the well-known features in Death Valley are located in the southern section of the national park. Visitor facilities are concentrated around Furnace Creek, at the 178/190 road junction - here there are several campgrounds (some closed in summer), various shops and hotels, a petrol station, a museum and the main park visitor center. This is the place to obtain maps and other information since unlike most national parks there are no manned entrance points elsewhere in the valley. There is even a golf course, presumably for winter use only. mostly across mud flats and sandy plains. The interesting part is the two miles below McLean Spring where the waters persist all year, and in spring form quite an extensive network of branched streams, marshes and pools, some several feet deep. The creek here is bordered by green bushes and reeds yet is surrounded by bluish white mud hills, completely barren - quite striking scenery. This area is reached by a short side road off CA 267, 15 miles north of Furnace Creek - a raised boardwalk loops round some of the streams and a faint path continues further along the valley, though walking away from the official trail is not encouraged. 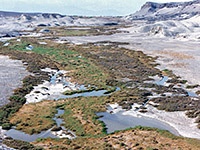 The pools have large numbers of the endangered Death Valley pupfish, one of several very isolated colonies that exist in wetland regions of the Mojave Desert - another is found at Devils Hole in the Ash Meadows National Wildlife Refuge in Nevada. One of the most famous sections of Death Valley is the highly colored badlands around Zabriskie Point, Golden Canyon/Gower Gulch, Twenty Mule Team Canyon and Corkscrew Canyon. Similarly unusual and varied colors are visible a little further south in the rocks and canyons along Artist's Drive, a narrow paved one-way loop on which travel is possible south to north. 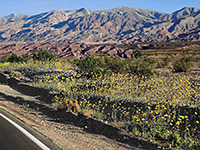 Often the road bends sharply and crosses steep gullies, resulting in a rather tortuous journey with a top speed of only 15 mph, but this is a very rewarding trip with much unusual scenery, and particularly outstanding is Artist's Palette, a stretch of the hillside composed of curved bands of clayish rock in vivid hues of green, white, pink and black. There are plenty of parking places, to allow for taking photographs and exploring on foot, and the drive should be passable by all but the largest of vehicles. The route is only 9 miles long but takes at least half an hour to drive. As it climbs into the hills, there are great views across the salt flats below to the west. 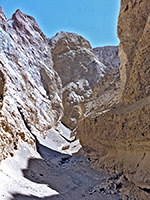 Many short, narrow canyons cut into the mountains north and east of Artist's Drive; the road passes across several dry washes then emerge from some of them, and all are worth exploring. One of the longest runs just below the main Artist's Palette overlook and can be followed into the hills for at least a mile through the extravagantly striped and eroded rocks typical of this area. A second is Natural Bridge Canyon, located a few miles to the south, while one mile beyond the north end of the drive, an unsigned track leads to another good narrow ravine - Desolation Canyon. This starts as a sandy wash through yellow/brown badlands, similar to those around Gower Gulch just to the north, but soon becomes up to 10 meters deep in places with vertical sides, though mostly the walls are less sheer. 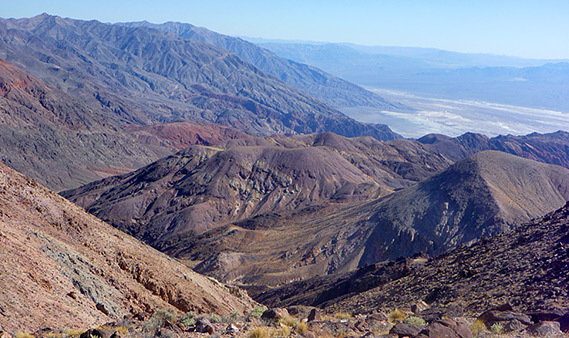 The passages are dusty, crumbling and quite winding, but the canyon does not go on too far as after branching several times it becomes shallower, ending at a ridge that overlooks the end of Artists Drive and some of the Death valley salt flats - a nice view. A round trip to this point takes less then an hour. Further south in the Black Mountains, the side canyons are generally steeper though the lower ends can still be entered easily, such as Willow Creek. 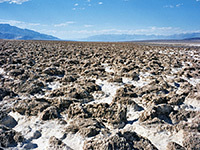 Devil's Golf Course is a large expanse of land completely without vegetation and covered in crystalline salt deposits. The surface is sharp and very uneven, with hollows and pinnacles up to a foot in size so walking is quite difficult - this is a place to look at but not much else, although early settlers ('The Forty-Niners') did manage to cross the terrain as early as 1849 during the California gold rush. It is said to be still possible to see their wagon tracks in the salt from the ovrlook far above the valley at Dante's View. The Devil's Cornfield, near Stovepipe Wells further north is an unrelated feature - this has isolated high tufts of the arrowweed plant separated by stretches of empty sand. Just south of Devil's Golf Course, the shallow salt pools at Badwater mark the lowest point in North America. Highway 178 continues south for 27 miles at or below sea level to Ashford Junction, one of several locations in the park where car radiator water is provided. Two miles before the junction is a collection of ruined concrete buildings at Ashford Mill, site of a processing operation where gold was extracted from ore excavated at a nearby mine. 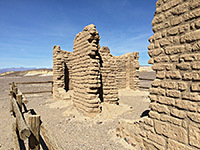 This was not commercially successful and the business was shut down in 1914, leaving the buildings to gradually decay, and they now stand isolated on the edge of a small cliff, in the middle of a rather desolate region. 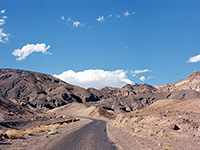 At Ashford Junction, the main road climbs through the Black Mountains to Shoshone, while a rough, sandy track continues at sea level to the mouth of the valley and eventually links with a paved road to Baker.